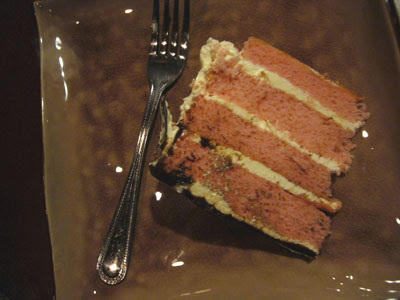 Everyone loves fluffy pink cake. No? 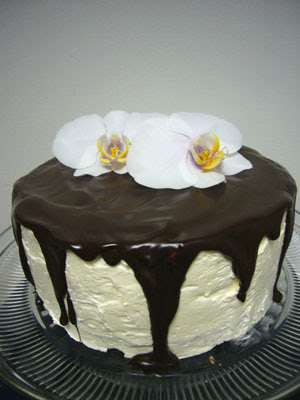 Especially with vanilla buttercream and dark chocolate ganache. I made a cake for my friend Amy's birthday over the weekend. It's pink, our sorority color, from college. And truly, it is a cake fit for a real l-a-d-y. It's the tallest cake I've made thus far; I couldn't even put the cake dome on without squishing the orchids. Generally, I try to stay away from using food coloring in my cooking, but this time I made an exception. All little girls want a pink cake for themselves. Even some little boys too. I've also decided that swiss meringue buttercream is my favorite kind of frosting. Butter frostings, cream cheese ones, fondants, glazes- all pale in comparison to this light, creamy, melt-on-your-tongue goodness. 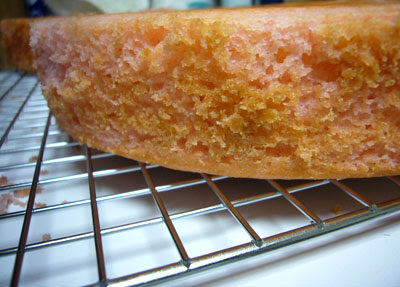 The texture renders it perfect for frosting layer cakes. It's like mortar for bricks, but a million times more magically delicious. The recipe for the cake and buttercream is one I've used before. I simply added a few drops of pink food coloring to the cake batter. On top of that, instead of using all cake flour, I used half AP flour, half cake flour this time to make a sturdier cake, better for cutting and frosting. 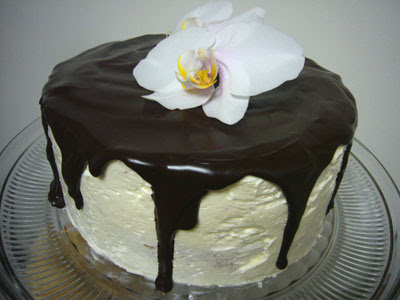 The ganache recipe is simple (from America's Test Kitchen). Heat 1/2 cup heavy cream, 1 drop light corn syrup, 1/2 tsp vanilla extract, and 1 Tbsp sugar to a low boil in a small saucepan. Pour over 4 ounces of finely chopped dark chocolate. Good quality, no less. Stir well. While still warm, pour over the frosted cake and let it drip off the sides. Refrigerate to set. Be sure to let the cake, or any butter cake, come to room temperature before you serve it, to allow the buttercream to fully develop their flavors once it hits the palate. It really makes a difference. Omg smores, the cake is sooooooo good. I'm having it right now at 4:30am before I go to work and it is making me late because I want to eat it slower. My favorite part is seriously the frosting. Thanks for making me fat :( This is my favorite cake that I've had in forever. How much will you charge if I need one commissioned like when my mom visits? Oh my gosh--that cake is gorgeous. If it tastes even half as good as it looks, it must have been absolutely delicious. What a lucky friend! I agree re: swiss meringue buttercream - it is the BEST frosting and the only kind I use (unless I specifically want cream cheese, because some kinds of cakes/cupcakes warrant it). I think that the "buttercream" that most bakeries/home bakers make (confec. sugar and butter) is disgusting, as it is very chalky. 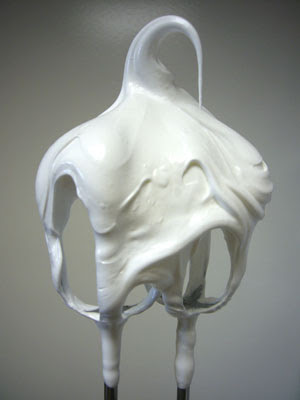 Nothing compares to the silkiness of a proper meringue buttercream. Once you go meringue buttercream, there's no going back!